Founded in 1957 by local dance enthusiasts, Richmond Ballet based in Richmond, VA functioned as a small, civic dance company until 1983. In 1980, Stoner Winslett was appointed as the Ballet’s artistic director, and under her leadership the Ballet has toured nationally and internationally. 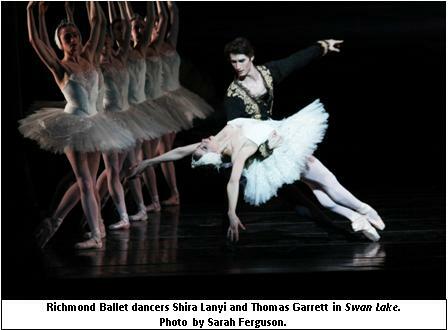 In 1990 the Ballet was designated as the State Ballet of Virginia, and contributes to the cultural vibrancy of Richmond as well as the national dance community. The Richmond Ballet and its work is uplifting, compassionate, and aspirational. These characteristics have guided and informed our past, present, and future. From the very beginning the Ballet sought to “awaken and uplift the human spirit, for both audiences and artists.” We believe in the unique and transformative power of dance to better our lives and spirits in the present. Our work is also compassionate. A compassionate community ourselves, we seek to make our entire community – much larger than the Ballet itself – more compassionate by reminding everyone that dance has a special ability to demonstrate the great reach of human potential. We believe that, when touched by a program of the Richmond Ballet community, new members feel good about being alive as they experience the dancer as the ultimate poet/athlete – a human being who pushes emotions and physicality to their limits every day. Finally, the Ballet’s work is aspirational. In the great words of choreographer Ted Shawn, we believe that “DANCE is a way of life, which will lead humanity into continually higher and greater dimensions of existence.” We believe dance has the power to show us what is possible in this life; it reminds us of how large we can dream, and how high we can reach. How do Richmond Ballet’s educational programs promote diversity and accessibility? 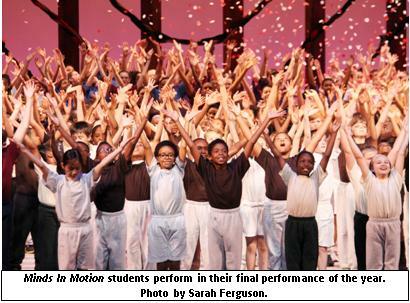 Minds In Motion has been the cornerstone of the Ballet’s educational outreach program since its inception in 1995. Minds In Motion seeks to reach elementary school-aged students from across the State of Virginia, from all walks of life and abilities, to expose them to the experience of movement and music. Minds In Motion is truly the realization of one of the Ballet’s core beliefs: that dance has a special and unique power to transform and uplift our lives and to reinforce our community bonds, and that there is an opportunity for everyone to participate in this transformative, positive, experience. In addition, through Artistic Director Winslett’s Scholars Program, talented students from Minds In Motion are invited to enroll full-time in The School of Richmond Ballet on scholarship. The School of Richmond Ballet, much like the Minds In Motion program, truly believes that dance should be an opportunity available to all, regardless of financial means. How does Richmond Ballet’s repertoire represent an innovative sensibility? The Ballet believes that commissioning new work is crucial for the innovation of the art form, and in this regard, we seek to support the creation of new works with the potential to become both significant in our time and enduring for future generations. We believe we have a duty to create substantive work in order to inspire change and forward movement within what Agnes de Mille called “the classic stream.” This classic stream both retains the good from our past while embracing the best from our present. Yet, it also thrives on new life, new art that forces a change in direction, pushing the stream’s energy forward, refreshing its path once more. Such work ensures the continuation of great art, and the creation of new classics or, in de Mille’s words, of “true magic.” For the Ballet, the opportunity to contribute to this stream means to support the creation of new works that are embraced by companies of all kinds and to watch these new works take form within the larger context of meaningful work across our field. If we do our jobs right, one day, these works do become part of the flow of forward energy in de Mille’s stream. As a result, the Ballet has created work which has influenced, contributed to, and perhaps even changed the stream of dance history and the progression of the art form. This is innovative, and this is our definition of innovation in our field. In today's world, successful ballet companies must be flexible and able to adapt to changing times (which implies a high level of awareness with regards to many factors – in and outside of the arts world). In Richmond, the Ballet re-examined the standard model of renting theater space in order to perform our smaller pieces, which ultimately led to the creation of our own in-house Studio Theatre. This has allowed the Ballet to control costs and retain a certain degree of flexibility that was never possible when working in outside venues. It is also very important that everyone in the organization – the artists, the administration, the Board, and the artistic team – is focused on the same goals and share a mission and a vision that is compelling, and inspiring. Working in the arts is no easy feat. There are long hours, never-ending needs to cut costs, and fewer and fewer bodies to go around. The fact that everyone is willing to work towards a common goal is crucial; everyone must embrace the pursuit of excellence and must be willing to demonstrate an unwavering commitment to the organization, even if it means working overtime, making appearances, reaching out, or thinking in new ways. These are the key to success. We believe that dance has a vital and meaningful place in today’s world, as well as in the future, with the power to inspire and motivate, to make us healthier and happier, and to change our lives for the better. Dance inspires the creation of supportive communities that depend on cooperation and mutual respect. Dance provides opportunities for children to further their lives by becoming teachers, dancers, administrators, and artists in their own way. Most of all, dance is an art form with the power to remind us about the good in this world, and is utterly pure and beautiful in its performance form. In order to demonstrate the Ballet’s vision for the future, we wish to share our vision statement: Richmond Ballet aspires to help transform our world through the unique and special power of dance by training and presenting ballet dancers as the ultimate artists/athletes who inspire us by demonstrating unlimited human potential and beauty. Through the work of Richmond Ballet, this community will continue to move towards one that universally respects the value of human life, both physical and emotional; the power of cooperation and mutual respect; the work ethic and discipline required to achieve anything truly meaningful; and the joy of existing in a compassionate community.